According to wordpress, this is my 100th post on CurrentlyKelli! LOOK AT ME! I am pleased with myself for making it work this long. I like the colors! I was eager to share my latest successful weird food combination with my followers, so I posted it on Instagram & Twitter yesterday. A lot of you may have already seen it. I prefer not to use previously posted photos for photo Friday, but who really caaaaares. One day I will actually think ahead for photo Friday and try to take some nice pictures to share with y’all here, but today is not that day. 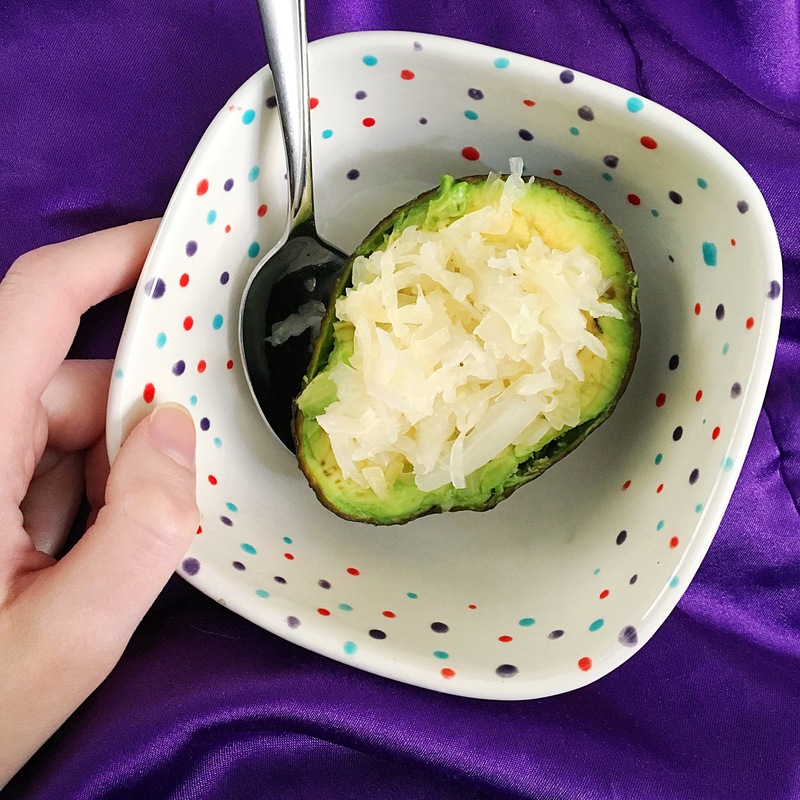 I know that avocado & sauerkraut probably seems like a weird combination to most of you, but I grew up eating avocado halves with white vinegar (just pour the vinegar into the seed hole and scoop the fruit out with a spoon), so this sauerkraut version wasn’t too much of a leap for me! It’s especially good if you get lots of kraut juice in the hole… mmmm. It’s also incredibly healthy because you get all those good fats from the avocado and healing probiotics from the sauerkraut. Win-win. I’m feeling better every day! I just need to keep working up my energy levels. For some reason, I was already exhausted when I woke up today, but at least I’m not experiencing much pain (only one or two occurrences all day, which is a HUGE improvement from the constant pain I was feeling only a few days ago). Yay. 🙂 I hope you take it slow and work to be your own best friend. I am not into sauerkraut, but I hear eating fermented foods like sauerkraut are great foods for UC. I am REALLY glad you at least got a break from the pain! I wonder if you extra tired because was starting to be successful fighting your UC to the point where there was no more pain. I always want to buy predisone for you!!! I wonder if you take any steroids, at least when you UC flares up. I wonder if there are any natural ways to increase the steroids in your body specifically. ??? Take care! And, prayers still coming your way via me and my prayer group!